ATC without the ATCs this time! Here are a couple more projects using the upcoming sets from the All Things Considered (ATC) line. The stamps are the perfect scale to work on smaller projects that could make great little gift items. Here's a Post-It Note cover which is very quick to make and would make a handy little pad for reminders around the kitchen. It uses two stamps from the Can It set. Using just a couple if Copics to accentuate the shading that the stamp already does for you means that this is a really quick project since there's no intensive colouring required. 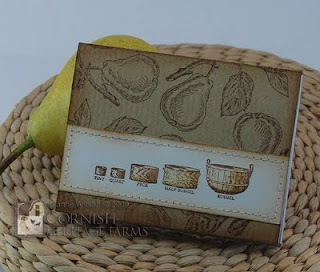 Just stamp the pear randomly over your cardstock and score it to fold around your Post-It Note pad. 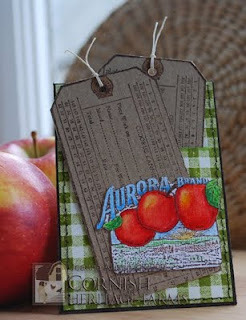 Stamp the containers onto Vanilla , add that touch of shading with your markers, sponge some Vintage Photo ink around all your edges and then machine stitch the image strip to the folder. You can add a piece of plain cardstock to the inside if you prefer not to see the stitching line. 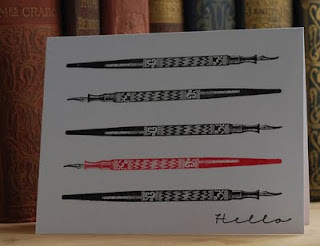 It's a 10 minute gift and I think they'd be great as stocking fillers or just to slip in with a "hello" kind of card. 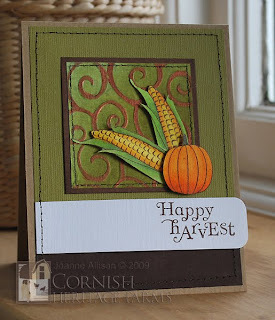 Speaking of "no reason" kind of cards and quick projects - here's a clean and simple project that showcases an image and a sentiment from the Fall Harvest set. The leaves are stamped on the same layer as the sentiment and trimmed to be "out of the box" (very little cutting required with this technique - way easier than cuting out the whole image and sticking it on!). I gave them the appearance of being separate by way of a shadow added with a couple of shades of grey Copic marker. It's beginning to feel a lot like autumn, isn't it?! Thanks for stopping by! Two ATCs with two ATC sets - I can't figure out if that's squared or quadrupled! There are two new releases coming in the All Things Considered line that definitely have the smell of autumn about them! 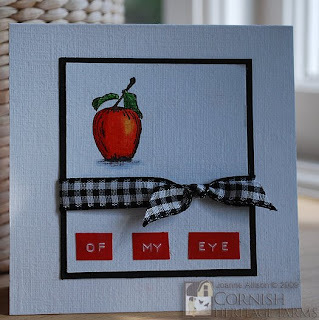 I have two ATC projects to share with you today, one from each set. 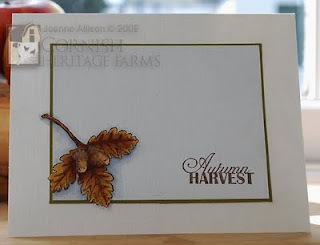 This is a fast and easy ATC made with the Fall Harvest set. 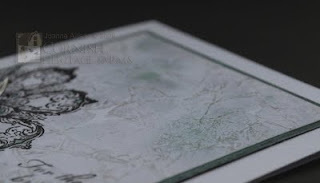 The handwritten bill of sale is perfectly sized to matt onto an ATC-sized piece. 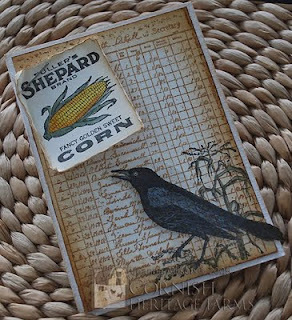 All I did was overstamp the crow in the corn and add tiny touches of shading with a couple of Copics. I trimmed to leave the bird's tail "out of the box" for a bit of movement. Finally, I stamped the corn label on a separate piece, coloured it and stapled to the top. Super fast! This second one is a little bit more involved but I had great fun making it! The tag is a "piece work" design with areas to record dates and quantities picked. I stamped two and then cut a slit in the gingham layer of the ATC so the second tag slips in there for safe keeping but is removable so you could write a secret message on the back for the recipient. The apple advertisement is coloured with Prismacolor pencils on textured watercolour paper and lightly blended with OMS - it gives a lovely intense colour! There are more fab designs in each of these sets - I'll share a couple more projects tomorrow! Thanks for stopping by. Here's my final project in the Cornish Heritage Farms and Shimmerz product swap - something a little different for a wedding today. I played around with a technique I've seen to make marbled effects from shimmer sprays. Never content to just do things as they're described, I've added "splodges" (technical term) of Shimmerz paint to the basic spray idea for areas of subtly contrasting colour. To achieve this kind of effect, just spritz a piece of card quite heavily with your Shimmerz Spritz (I used "Concrete"). Once you have good coverage, add random splodges of a toning colour of Shimmerz paint (just drip it off the end of a paintbrush or toothpick). Scrunch up some plastic food wrap, flatten it out a bit and plunk it down onto your card piece and pat gently with the flat of your hand to get good contact. Now go and have some lunch, walk the dog, pick the kids up from school or whatever happens to fit your day and get you away from the craft table for a while. Once it's had a good while to dry, peel off the plastic wrap. See what happened? (You can click through on the pic for a better view.) All those lovely mica particles got concentrated into the wrinkles in the plastic wrap and you have a shimmery, marbled piece. Leave it for a while to make sure it's thoroughly dry and then cut it up and stamp away to your heart's content. I went with an elegance thing and used the beautiful medallion-style stamp from the Ornamental Beauty set so that the background is playing a key role in the piece but there's plenty of interest in the pattern, too. The other thing I did here was to use the Shimmerz paint on black cardstock. Just enough of the colour shows (and of course you get the shimmer) that you end up with a kind of verdigris effect. My Prima flower also got a coat of paint. Thanks for stopping by today, hope you enjoyed the card and the few days of shimmer! 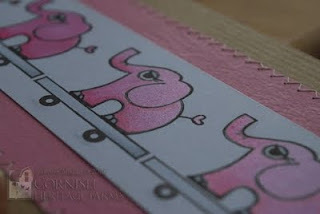 Or maybe that should be "Pink elephants on the hop" since we're blog hopping today. Don't worry, I'm not going to show you any scary cartoon sequences. What were those animators on - yikes! The pink elephants here are a darn sight cuter than Dumbo's hallucinatory experiences too, lol! 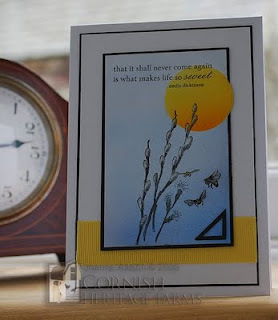 This is the second of my projects in the Cornish Heritage Farms and Shimmerz swap. What's more girly than Bubblegum pink? Bubblegum pink with some shimmer, of course! I found Shimmerz works well with watercolours so I added a little pink watercolour pencil to the lower part of each elephant and then used the paint to blend the pencil and colour the rest of each image. I decided not to add a sentiment just yet - I think this design would be cute with a personalised tag added when baby arrives - maybe pinned to a twill bow with a mini safety pin? Here's a detail shot so you can see the shimmery pinkness here - super-girly huh? The next stop on the hop is Kristine - she'd love to welcome you in sunny California to see what's Shimmering there! Cornish Heritage Farms and Shimmerz have teamed up for a bit of fun this week! Liz gave the Shimmerz design team some stamps to play with and Stacey gave the CHF Team some Shimmerz to play with! Trees in full leaf often have a shimmering effect when the breeze blows through so I figured a tree would be perfect for the Shimmerz treatment! 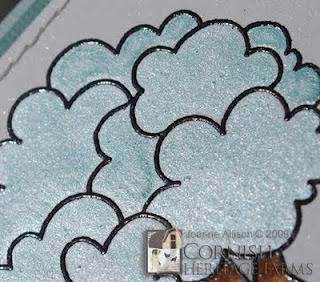 I used detail embossing powder to emboss the image and then flooded each area with Mint Shimmerz paint - the raised line of the embossing keeps the paint contained. You can put a big blob of paint in the centre of the area and then just push it gently to the edges with a paintbrush, it's a really quick and easy colouring technique. Hopefully this detail shot will give you a better idea of both the shimmery effect and the way the raised boundaries work. I just used a marker to colour the tree trunk and cut little slits each side so I could thread through my sentiment strip. A vintage button adds that extra touch of whimsy to finish it off! 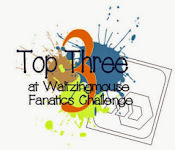 You can check out the CHF Be Creative Blog and the Shimmerz blog to see more projects and the CHF girls will have a little blog hop for you tomorrow, too so drop by if you have a minute, we'd love to see you! Thanks for stopping by, hope your day has a little shimmer to it! I know it's still summer (such as it's been) but autumn is just around the corner and my organic veg box delivery this week contained a small pumpkin so I reckon this set of stamps is timely! "Fall Harvest" is the latest of the General Motors releases and although there's the obligatory truck on the sheet, there's also lots of fabulous veggie stamps! The pumpkin was just crying out to be piled up in a great big pile of orange goodness! It's a really easy shape to cut so making masks is easy and, as ever, I just pop them into the case with the stamp set so I can reuse them and the cutting out effort is a one-off (at least until they get so tatty that they become unusable!). 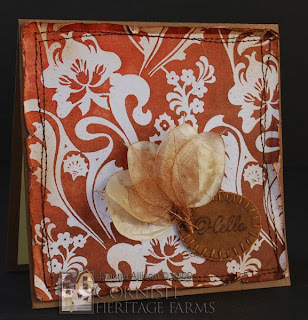 Kraft cardstock has a great look and feel for autumn projects and raffia just seemed like the right kind of finishing touch somehow. I had more fun with this set for a Splitcoast technique challenge this week. I love resist techniques and Lynn pointed us to a couple of blogs with a leafing pen resist tutorial (Carol who in turn got it from Trish Bee). Now, my Krylon nib is a little, ahem, frayed. That meant I found it impossible to get a pattern I liked as I was trying for a small scale pattern with a broad and tattered nib. So I "refined" the technique by embossing my watercolour paper in a Cuttlebug folder, used the Krylon on the raised bits, ironed it flat again and then carried on as described in the tutorial. 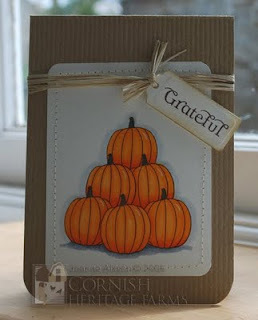 The pumpkin came out again along with a couple of ears of corn, some textured card and some stitching to make a touchy-feely kind of card which seems about right for autumn to me! What's on your desk? I bet it's a computer, a printer and a pile of crafty bits! It's probably not an antiquated typewriter and a dip pen ;o) The "On the Desk" stamp set has those though and I've been having fun with them. Julia Stainton is absolutely on a roll at the moment - the stamps she's designing for the Rummage Bin line are all just lovely! 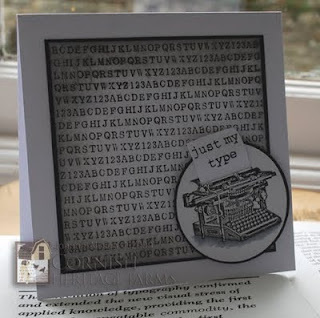 I thought it would be fun to have a sheet of paper in the typewriter (one of my DT teamies said "Oooh, great reminder of how a typewriter actually works - I'd forgotten, lol!"). I cut a little slit with a scalpel and threaded the paper through so it looks like it's round the rollers of the machine. I curved it a little over a paintbrush handle too, just for a bit extra dimension. Delving even further back in time, how about a dip pen? Not even my hubby, who loves his fountain pen, goes quite this far! I thought this stamp made a perfect basis for a super-fast and simple notecard. This is really quick to make and absolutely minimal supplies means you could easily make sets of these to give as gifts, too - they'd be fun bundled up with a red ribbon and faux wax seal for presentation, I reckon! Thanks for stopping by, have a lovely weekend! I'm a bit slow off the mark with the second RSS challenge and you wouldn't believe how long this card has taken me! I'm still not entirely happy with the balance of my finished project but I decided I'd invested enough time that I'd share anyway! As you can see from the recipe, the challenge this time around really did have some challenging ingredients! I thought I was going to find the acetate the trickiest but in the end it was the ribbon that proved most problematic! How hard can it possibly be to include ribbon in a design, for crying out loud? I do it all the time! After much fiddling, faffing and muttering under my breath, in the end, I just stopped treating it as ribbon and included a flat strip as a colour block. 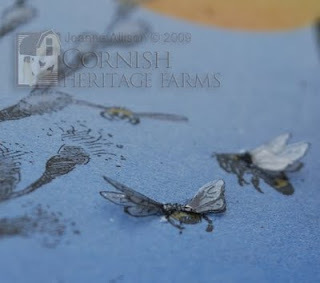 I made 3D wings for the bees using inkjet transparency. I stamped on the smooth side with Stazon because I found that the slightly rough side would take Spica glitter pen so I've coloured the backs of the wings with a clear one to give them extra shimmer. I attached the wings with tiny beads of Glossy Accents. This is my first real play with the Copic airbrush system using a mini compressor rather than an air can. I didn't try anything too fancy but I was pleased with the way the shading on the sun came out and found it easy to handle. I don't have to worry about the waste created by air cans either! 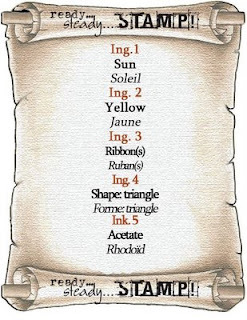 Je sais qu'il ya beaucoup de participantes françaises pour les challenge RSS - si vous voulez me laisser un commentaire, mais vous n'aimez pas le faire en Anglais, s'il vous plaît n'hésitez pas à le dire en Français! Je ne le parle pas bien, mais c'est OK pour la compréhension de commentaires court. Merci de votre visite! 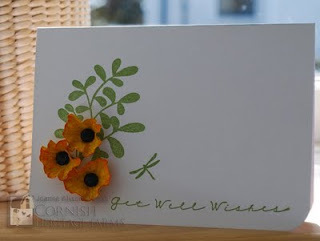 When I saw the little poppies on Kathy's tarted up tin project the other day (here) I thought it would be nice to make some bright, cheery yellow ones for a get well card. I was so happy to see this sentiment in the new Cursive Expressions set; for some reason I've always shied away from "Get well soon" - I guess it sounds a bit too much like a command! You wouldn't believe the number of times I've pieced together "Get well wishes" from a couple of different stamps! My brads started life as common or garden brass paper fasteners as I couldn't find black brads of the right kind of size, I just Versamarked them and dunked them in black embossing powder and heat embossed. Thanks for stopping by, hope you're enjoying your weekend! This project is in the September/October edition of PaperCrafts magazine (I haven't seen it yet but Darlene tells me it's on p65 if you happen to have the mag to hand!). 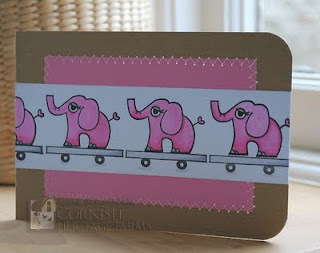 I loved the way this card turned out and was so pleased they picked it up! The call was for projects with "fall texture" so I've included felt for something warm and snuggly as well as skeleton leaves and seedpods from an honesty plant (that's probably a silver dollar plant to my US friends). The technique is "faux batik" - it works like a regular resist technique but then you use an iron and plain paper to remove the embossing powder after inking/spritzing so the embossed area is no longer shiny. Thanks for stopping by - hope you enjoyed the card! I thought it would be fun to use the new School Primer set to make something that wasn't school related. A little visual word play makes for a fun design to let someone know you think the world of them. As the apple has a bit the look of an illustration from an old book, I decided to add a modern twist by using Dymo tape to complete the sentiment. 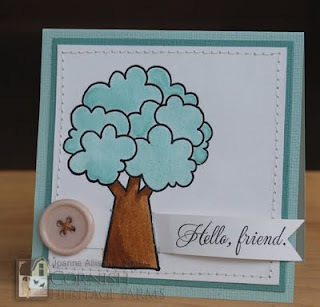 The layout is a sketch for a "Clean and Simple" challenge over on Splitcoaststampers. I discovered that artist grade pencils and OMS work beautifully on watercolour paper (this is from a big pad I bought cheaply at the Papermill some time ago - I like the texture and it's sturdy enough to stand up well as a card base). Thanks for stopping by, hope you get to spend a little time with the apple of your eye this weekend, whoever that may be!